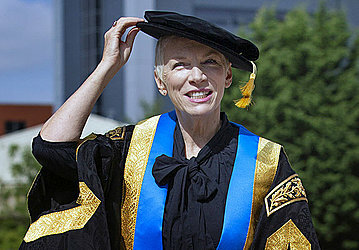 LONDON (AP) — Singer-songwriter Annie Lennox has been made chancellor of Scotland's Glasgow Caledonian University, becoming the first woman to occupy the ceremonial post. Lennox, who had critical and popular success during the 1980s as the voice of British duo The Eurythmics, said Monday she was "humbled and awed" by her appointment. She was installed during a special ceremony at the Glasgow campus, where she vowed to use the chancellorship to further the university's mission. The 63-year-old Lennox says that while she never earned a degree, she could be considered "an honorary graduate from the school of life." She said she comes from a "long line of hardworking Scots" and grew up in an era when "young women from working-class backgrounds gaining university degrees were as rare as kangaroos in the Antarctic."